Seeing a picture of the always fabulous Miss Winny in this toile design a couple months ago sparked a dress lust inside me so fierce it almost made me ache with the sad fizzling passion of a dying sun. The dress is Le Palais Vintage, a line Winny designs herself, but said line doesn’t size high enough to accommodate my pasta tummy and my cake hips, so buying this exact dress was out of the question for me. I went on a google spree and found a picture of Dita Von Teese rocking another gorgeous toile design–a Vivienne of Westwood number, which was, needless to say, out of my price range. My search engine travels did turn up many a willow pattern-esque result, but all of them seemed to price at $150 and above and this little lady has got to stop spending so much this year to start saving for her stateside jaunt this fall. ‘HELP ME. I AM IN LOVE. THOU NAME IS TOILE AND THY BUDGET IS SMALL’ I wifi-weeped to my pinup friends across Whats App and Facebook and Instagram, in a manner that was certainly no more dramatic than the situated warranted. Promise. My fellow British Belle Samara pointed me in the direction of a Vanity Project Sally Ann toile dress on Audreystarsboutique, and while it wasn’t hitting the exact spot for me that I wanted–I wasn’t crazy about the short sleeves and I wanted a swing rather than a wiggle–another Vanity Project dress on the site did: the Vanity Project Betty Day of the Dead Dress in blue. Originally £99, this dress was reduced to £65 in the sale and ASB offer a 10% code to first time buyers bringing my total to £58.50. It’s still available on Audreystarsboutique for £59 in the sale now, so if you’re a first time buyer and use the voucher code you can get this dress for £53.10, very nearly 50%. Bargain! But before I take credit for potentially saving you many pennies on this dress, it’s probably time for us to take a look at it. Another doggy attracted to a cute dress! This dress is offered in UK dress sizes, so I ordered a 14 as is my current size and it fits perfectly. No gaping or bagging anywhere, nor any pinching or straining. I love the half sleeves and think the neckline is flattering, and because I am addicted to full swing skirts the only thing that would improve this dress for me is a full circle skirt, since that’s how I roll y’all. The belt is sewn to the seam on one side and the ties are equal in length, which seems a bit weird to me because I feel if the bow is supposed to be tied in front then the tie that comes around your body from the back should be longer to create an equally sized bow at the front. This bugged me when I first put it on because I wanted that perfect bow, but in reality the bow it creates is fine and isn’t noticeably lopsided or unequal to anyone taking in the glory of your lovely self in your lovely dress. The main difference between this dress and the other toile patterns other brands are making is, in case you didn’t notice it before now, that the toile isn’t comprised of pretty blue flowers but a blue Mexican day of the dead inspired print. This kind of print isn’t my usual thing at all, but as the dress was in my budget, a pretty cut, and not noticeably gothic or macabre at first glance, I decided I kind of liked those funky blue Mexicans and I could handle sporting them for a change of pace. This is a great dress and I’m really glad I found it. Though it lacks that full circle skirt I wear almost exclusively that doesn’t dampen the affection I have for the piece. That is not a phenomena a non-circle dress can usually lay claim to, so that speaks to it’s overall loveliness. It’s not a thick material so for winter wear it has to be a layering piece to avoid the kind of shivers and squeaks I emitted in the chilly conditions of this blog shoot, but I think layering up this dress would be totally worth it. 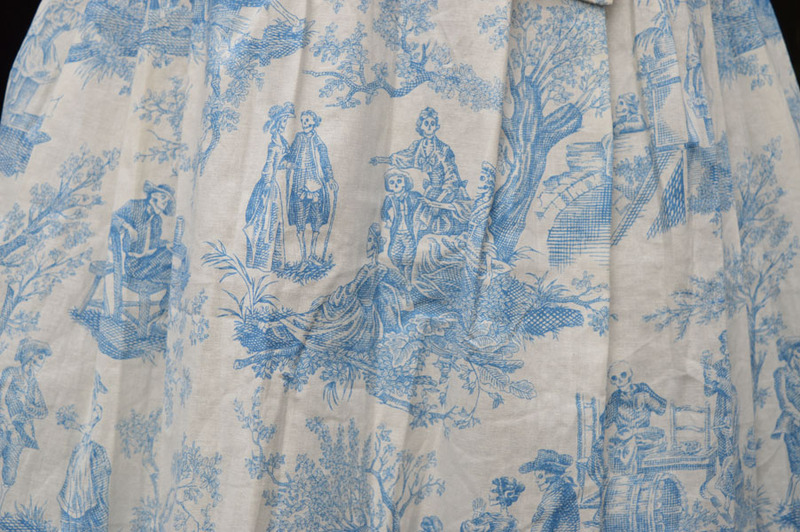 A great find for achieving my toile fix. 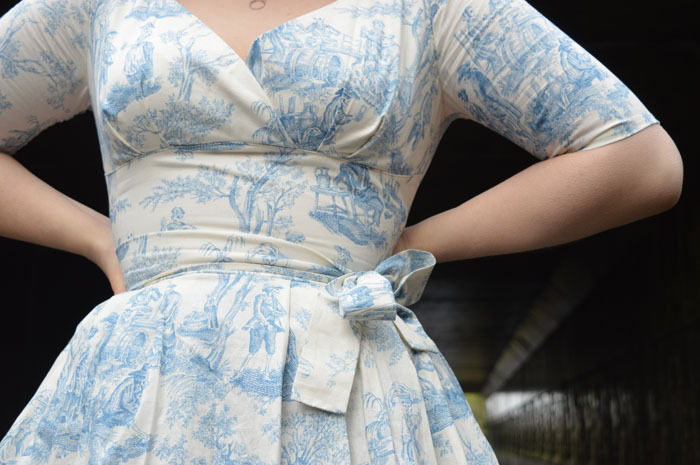 This entry was posted in Clothing Reviews and tagged 50s, Audrey Stars Boutique, fashion blogger, pinup style, retro, toile, Vanity Project, vintage inspired, vintage style by missamymay. Bookmark the permalink. That dress is to die for and you look absolutely stunning miss! Eeep, very behind in my comments. Thank you, beautiful! BAH! I remember when you posted the Dita photo on IG – I too was very sad when I saw that it was highly out of my budget. I starred at it lustfully and moved on. I followed the link to Audrey Star’s Boutique and thought to myself…GREAT more things I can’t buy!! So I went straight to their sale button and I saw this dress that drew my eye real quick…believe it or not, twas the same day of the dead dress…but in the neutral color – pretty!!! Right now I’m saving my pennies for a Bernie Dexter skirt that I LOVE!! But this is a great piece as well! Love it and thanks for the new website!! P.S. 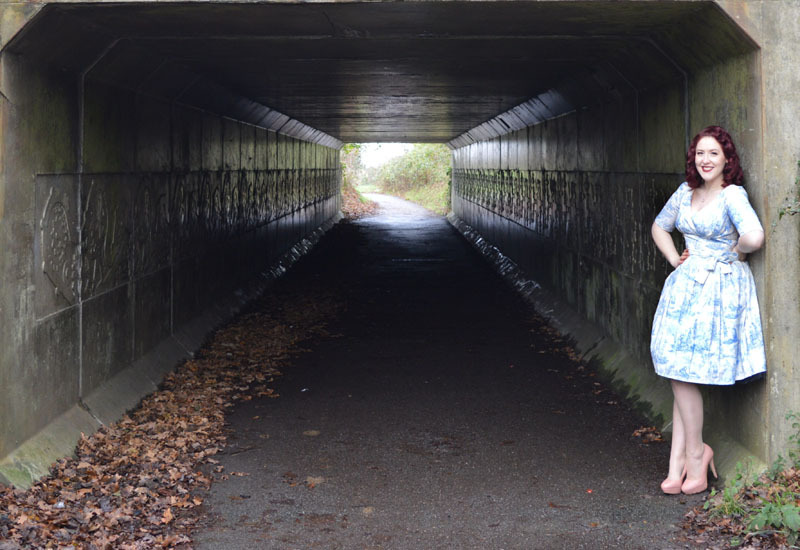 Is the amazing backdrop of a tunnel near where you live?? Such a fantastic place for photo opportunities. The tunnel is about 15 minutes from where I live, it’s just a pretty public footpath my sister suggested we take pictures near. I can’t wait to see which Bernie skirt you’re saving for! Her dresses don’t fit me super well but she has so many gorgeous prints.